Truth or Square (Video Game) – From SpongePedia, the biggest SpongeBob-wiki in the world! 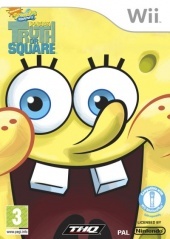 SpongeBob's Truth or Square is a video game based on the SpongeBob SquarePants episode with the same title. It was released on October 26, 2009 for DS and PSP, and November 6, 2009 for the Wii. This video game is based on SpongeBob's 10th Anniversary. It is the first SpongeBob game since SpongeBob SquarePants: The Yellow Avenger to be released on the PlayStation Portable, the first SpongeBob game released on Xbox 360 (besides Underpants Slam!, which was released for Xbox Live Arcade), and the first SpongeBob game on a home console that's not on PlayStation 2 since SuperSponge. After being entrusted by Mr. Krabs to keep the Krabby Patty formula safe, SpongeBob is overcome with grief for losing the recipe. He then relies on the help of the most unlikely companion, Plankton, who wants the secret Krabby Patty recipe for himself. With the help of his friends, SpongeBob must use Plankton’s memory machine to retrace the happiest moments of his life to find the Krabby Patty formula in time for the Krusty Krab’s Eleventy Seventh anniversary. Note: This level in unnamed in the DS Game. This game includes a multiplayer mode in which the second player can play as Plankton. In the game, they can stun, zap, or grab enemies. When they stun the enemies, they will be temporarily stunned for a short period of time. This is an advantage to player one. When they zap an enemy, they will be damaged. When they grab enemies, they can shake the enemies left and right or they can slam the enemies down. This stuns them for a limited period of time. This may be a prequel to Truth or Square (Episode). This game is developed by Heavy Iron Studios, which is the reason this game uses many elements from Battle for Bikini Bottom, another SpongeBob game, such as music, enemies, and objects like tikis. Three bosses (one which was scrapped from the home console version of Battle for Bikini Bottom) make an appearance in Truth or Square. It also has similarities to the SpongeBob SquarePants: The Movie game. Prawn makes a small appearance in the background of the 6th level. He is frozen in Tartar Sauce like ManRay was in Mermaid Man and Barnacle Boy III. However, if you walk up to him, SpongeBob says, "Ahhhh! ManRay!". The level, "That's Not Your Formula, Plankton! ", may be originally named "Becoming a co-casher", because the official site called this level "Becoming a co-casher". The last level for the DS Game is labeled "???" for some unknown reason. And an exclusive level called "Krusty Krab Recall" is on DS edition. This page was last modified on 8 January 2016, at 18:57.